Kitchens Are Monkey Business: Pot Stickers And Stir Fry! which he does very well. and a pork and broccoli and bok choy, among other things, stir fry. It's going to be a very good lunch, indeedy. Now, I'm starting on the pot stickers. and whack it with a rolling pin. Cover with about 2 tablespoons water. Let sit while you prepare the rest. and poured into the salted and peppered pork. Add in the ginger water, not the ginger. 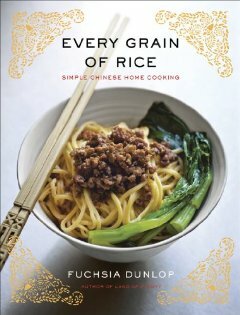 Every Grain of Rice - Simple Chinese Home Cooking. Save the ginger for the stir fry. Your hands are the two best tools in your kitchen. in the center of a wonton. Dampen the edges and seal. Heat to 340-350° and add in wontons. Cook until brown on the bottom. I don't think anybody browns both sides except me. and cut of the heat. and Middle Hawthorne has prepared the rice. Now, I'm ready to do the stir fry. Mr. Hawthorne had sliced the pork loins earlier. It's best to do this while the meat is slightly frozen. They probably marinated for about 30 minutes. Long enough for me to prepare everything else. My wok is over high heat. I poured in a few tablespoons of peanut oil. and dump in all vegetables except for scallions. Pour about 1 cup water down the side of the wok. Pour vegetables into a bowl and cover. I see Mr. Hawthorne has added some sliced garlic to the pork. Heat wok and add in 2 TB peanut oil. Add in handfuls of the pork strips. Here's the stir fry with rice. And there are so many colors! Plus you have all those textures and tastes. DElicious! I could go for some of that! Lea, I'd love to serve it to you!